Whenever I am sick, my husband becomes the primary caregiver of not only me but our two young kids. While acting as my personal food and water-fetcher, he must also entertain and feed a 19-month-old and 6-year-old for long stretches all by himself. That’s no easy feat. Keith’s repertoire of food preparation has come a long way since we started dating 10 years ago (gone are the Steak Umms he used to fry up. I know… wicked gross). He doesn’t know how to make much and every new recipe is a stressful experience for him but he’s a dedicated trooper and knows that the kids need to eat vegetables. So last week, he broke out the broccoli and used Google to help him figure out cooking stuff that comes much easier to other people. Luckily, the past two weeks have been only intermittently tough. The day after my infusion, I actually felt pretty good. Life went on as normal and I went to a pretty hard yoga class in the evening. I even posted a braggy Facebook post about how awesome I handled chemo. Then I got humbled. It was two days after my infusion that my body registered the powerful chemicals that had been blasted into my bloodstream. I woke up with a low-grade fever and a flu-ish feeling and couldn’t do much except lay in bed. I spent an embarrassing amount of time feeling sorry for myself. One of the crazy things about chemo is the amount of drugs you must take to try and feel normal. 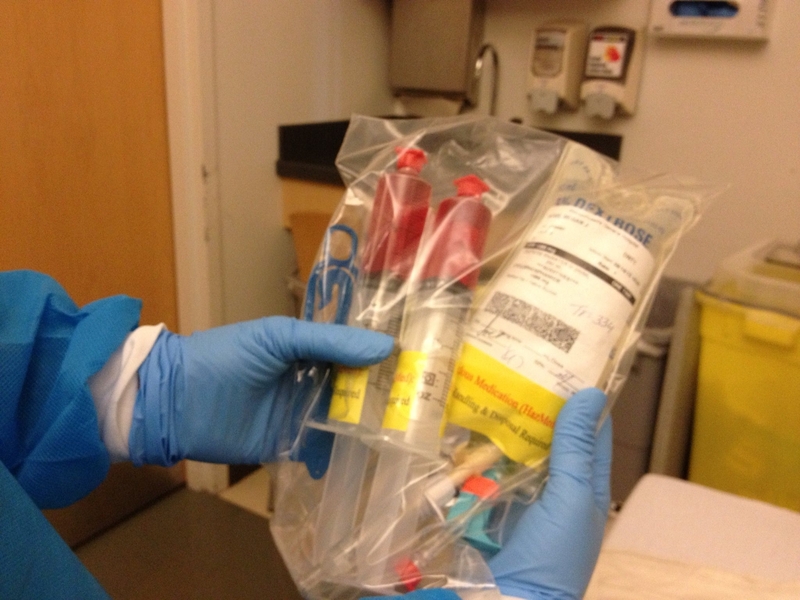 My nurse holding up the two chemotherapy drugs I receive. Notice the one on the left is red. I was assured the color is no biggie. On infusion day, they give me a chemo cocktail that kills cancer cells but also causes extreme nausea. So to combat the nausea, they give me a very expensive anti-nausea drug. But to make the anti-nausea medication work, I have to take steroids. Taking steroids is great until you have to stop taking steroids. I can say unequivocally that the depression accompanying steroid withdrawal is worse than any other flavor of depression I’ve had (and I’ve had a lot of flavors). When the steroids are stopped, I have three other anti-nausea medications to alternate between. Some days this crazy mix of drugs worked really well and some days it didn’t. Some days were tough. And when they were tough, man, they were TOUGH. Of all the crappy parts of chemo, though, I’d say the absolute worst part is my inability to parent when I’m feeling lousy. As I laid waiting to feel better on my sick days, I felt guilty for not being able to play with my kids and leaving my husband to do everything. It turns out that maternal guilt doesn’t take a vacation even when you have a life-threatening disease. Luckily, last Thursday, eight days after my infusion, I had a breakthrough. I woke up that morning feeling significantly better and each day from then onward was an improvement. I’ve felt good for the past few days. Tonight is the eve of my second chemo infusion. Now that I know what to expect, chemo is not an unknown kind of scariness. But it’s still scary. My husband, a teacher, went back to work this week and I am wondering how I’ll be able to take care of my kids while I’m sick from the chemo. I know it can be done since I have amazing women in my life who have survived cancer treatment with young kids and have been holding me up with practical suggestions, hope, and encouragement. But I know the sickness is coming and I’m not looking forward to it. In advance of my hair falling out, I dyed my hair purple. Since hair-dying is an age-old remedy for female depression and discontent, I found it quite rewarding. Previous Previous post: Starting round 2 of chemo… I think. You are awesome. Praying for you and in your corner. 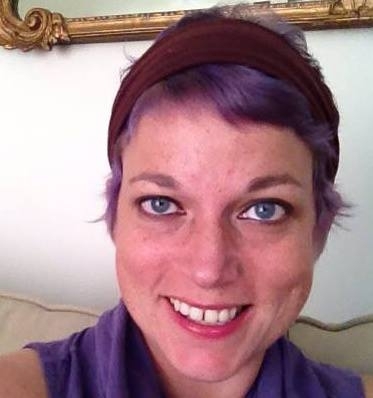 Megan–I am a breast cancer survivor–diag 4/2010…started chemo in 5/2010 and it ended 9/20/2010. I will keep you in my prayers…I had different ups and downs each time I had chemo…and it did seem to have a cumulative effect. I have come to know many cancer pts—still mostly breast cancer–and each one seemed to follow both a similar but sometimes different course of treatment. Enjoy the days you feel really good, and don’t beat yourself up over the days you do not feel well. I had some great family but sometimes even greater friends who would ‘abduct me’ and take me away. I am single and had no children, but my downfall was I was a registered nurse who felt I should know EVERYTHING about cancer and its treatments…not my specialty…but I was often very hard on myself. I did not go to the internet…I let my nurse friends do that…and it was very hard for the caregiver in me to take help from others…I wish you only the best…Jackie N.
Oh man, the drug-induced depression part seems particularly unfair in a list of things that’s already wicked unfair. I hope this part passes quickly and that the good moments outnumber the bad. LOVE the purple hair!! You rock!! Megan, I am Christa’s Mom and I have been following your journey. I just have to tell you how awe inspiring you are. You are taking this crappy journey with intelligence and an amazing amount of humor. I don’t know you, except for these posts, but I love you. Know that I think of you daily. My hope is that after this chapter of your life is done that you will continue to write and share your unique outlook on life. Hang in there kiddo. It gets easier… tough to imagine but it does. Head high and laugh often. I’m proud of you AND your husband.